We’ve obviously had weather conditions perfect for broom this Spring, because the hillsides are entirely yellow at the moment. Although beautiful when all in flower, broom is a plant that proving difficult for us to keep under control. I can fully understand why, in some parts of the world, it’s considered an invasive pest. As a nitrogen fixer it’s capable of changing the soil profile and making it unsuited to local plants once it gets a hold. One imagines that a nitrogen fixer would be something to encourage around the garden, but in the quantities that this stuff grows, we’d rather rely on other, more easily shifted legumes. If you cut broom down, it tends to coppice and become even more difficult to remove so we’ve found that the easiest way to permanently shift it is to pull it straight out of the ground whilst still small enough to yank. We’re aiming to leave a couple of small patches in the goat pasture areas as shade and we’re hoping that the goats will find the young and prolific seedlings tasty enough to keep from spreading. In the wooded areas we are trying to keep it under control by regular cutting, with fire risk being our primary motivator. We’ve found several uses for it around the farm so far. After hearing that it can be used as a roof thatch substitute, Pete experimented with it on our dog kennel. After a couple of month it’s still holding up, but it’ll probably need replacing fairly soon. Perhaps a thicker layer would last longer. We’ve also used it to weave little fences around the mulch beds in the veg garden. The idea is that these will gradually break down, at which point the organic material will be incorporated in to the bed and fresh broom added to complete the fence. It does work and they look very nice, but the amount of work involved in weaving all those fences means that they’re something we’ll be looking to replace as soon as we can think of a better alternative. The goats do eat broom, but only a little nibble at fresh leaves and flowers so not really sufficiently to keep it under any sort of control. We include it in their daily cut and carry food, but only as a small portion for variety and to allow them to self medicate. We’re currently allowing more in the goat ration than normal, knowing that they’ll not eat it all. But they will drag it onto the ground and incorporate it into their deep litter bedding which we can subsequently haul out and use as a long term soil improving mulch on some of the furthest reaches of the field where the soil is particularly poor. There are no plans to cultivate those areas any time soon, so we figure that the resultant sticks won’t bother anyone and anything that does not rot down can be raked off at some time in the future if required. The yellow hills have prompted me to investigate broom more closely this year, so I thought I’d share some of the new uses I’ve discovered. Broom is, like many legumes, mildly toxic. I’m not a medicinal plant expert, botanist or any other type of expert so please do your own research before eating it. Be particularly careful if you have heart problems, high blood pressure or could be pregnant. However, we’ve been happily including it, in very small quantities, in our diet with no ill effects. The flower buds can be pickled and used as capers. They were a common ingredient in the old English salad dish Salmagundi and something I intend to try doing as soon as I can get a whole jar together. We’ve been using a few raw in salads which is tasty and colourful, and they’ve made a very successful addition to fresh goat’s cheese. The flavour got stronger as the cheese aged, and I preferred it young. It has medicinal uses but I understand that it’s rarely used as strength can vary hugely. If you’re interested, I urge you to do your own careful research. The dried seeds can apparently be ground and roast used to stretch coffee. The fresh tops can added to beer to add bitterness and increase strength. The bark is fibrous and can be used to make paper or cloth. This involves stripping the bark by steaming, boiling in lye for three hours and then put in a ball mill for a further three hours. An interesting experiment perhaps but not one I’m likely to have time to try out any time soon. Large enough pieces of wood would make attractive veneers and be of interest to cabinet makers. We’ve got some absolute whoppers around here, but the stems are still only a couple of inches across so pieces big enough to use must be fairly few and far between. 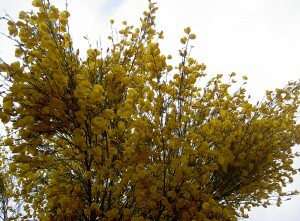 Broom flowers, kept in an airtight jar for ten days, have been smoked as a marijuana substitute in the past. The practice is unsafe, as the mould produced by the drying can cause an allergic reaction in some people. Finally, you can make either a green or a yellow dye from broom. 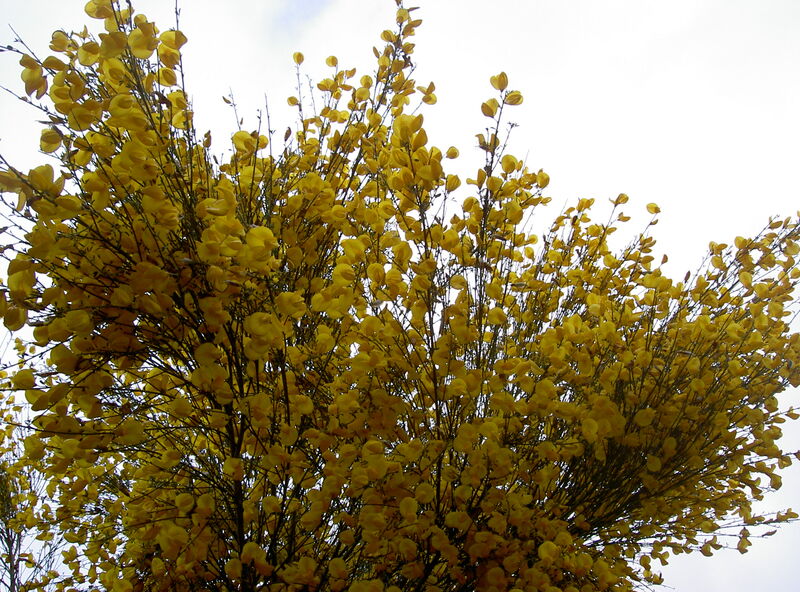 The flowering stems make yellow and the leaves and fresh tops make green. It’s also a good source of tannin. Despite that long list of possible uses, we shall be continuing the battle to keep it under control. 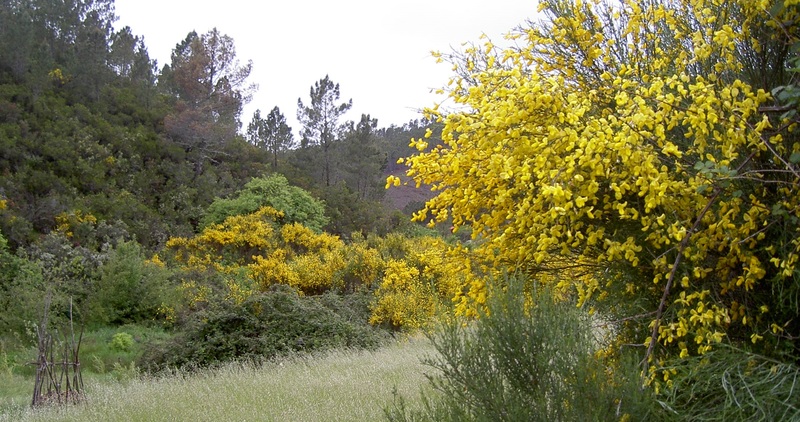 I’m just up the road from you and thought you might interested in my experience with Portuguese Broom (PB). Over a 7 year period PB spread across my land in my absence. I along with a friend decided to tackle it one day and tried to dig it out, good exercise but useless (extremly deep roots). Got a bit lazy and decided to just cut the tops as low to the ground as possible, 6 months later kicked the left behind root stump and it just broke off totally dead all of the rest were the same. I haven’t cultivated the ground at all and the broom has not returned? I was actually researching as I noticed a couple with an allotment digging it in by hand one year and I have also noted local farmers stock piling the stuff and beside a couple of goats and chickens do not have many livestock? I have another large area that I have left fallow with PB growing on it in case it has a manure/compost use? Nice to speak to someone nearby Rob. Where are you? A couple of years down the line I’m now wiser to broom battling. Strim it, often! Were the broom that you and a friend cut down larger ones? We do find that those, when cut, don’t tend to come back. The stumps sticking up drive me crazy though, right ankle breakers in long grass! It’s the mid sized ones that seem to be the problem re coppicing and shooting right back. As far as composting goes, if you leave it long enough the soft parts will break down nicely but it takes a good long while. I’ve been incorporating it into hugel beds, and we’re currently using it to bolster the banks on our swales, making hugel swales in other words! It’s a nitrogen fixer, so leaving it growing is arguably a good thing. It does pose a fire risk though, so bear that in mind. One further point relating to the article I wrote above. We wove the broom into little fences. They looked beautiful, but the time and effort that went into them just was not worth the length of time they lasted. On the plus side, when they decomposed it was straight into the beds with only a few sticks to remove, but I wouldn’t do it again unless it was a small decorative area.